Simple ways to entertain guests as a minimalist. How she reads so much in the busyness of life and what faith-based books she is enjoying right now. What courses to start with if you are ready to dive into simplistic living. You buy stuff with your time, not just your money. Less clutter equals less stress and more time. It's as simple as that! Your Uncluttered Home is my most popular, globally-praised decluttering course, designed for moms who want to live their lives more than they clean up after it. It's truly the A-Z of minimalism - every room, every area of your house, totally uncluttered. This super extensive, extremely detailed course is literally everything you need to become a minimalist mama who's able to be a lot more present for what matters most. This truly is the ultimate when it comes to my philosophy and implementing it into your own life. Question #1: How do you entertain as a minimalist, especially when your kids want to have friends over, but you don't have an abundance of toys or space? I technically don't need 15 coffee mugs, but what if I have friends over and we all want coffee? It seems like it can get expensive to always have disposable stuff on hand. This is a great question and I'm really excited to answer it. In Your Uncluttered Home, especially, I teach you how to make minimalism work for you, and I talk about this a lot in all of my free stuff too. You have to make minimalism work for you, who you are as a person, and how you use your home. For me, hosting is a huge part of who I am and how I use my home. I love being hospitable. Those of you who have been around for a while might remember when we bought a camper and renovated it. We traveled the country for about seven or eight months. The reason we didn't go a full year, which was the original plan, was because I couldn't take not hosting anymore. I missed having a home base. I missed having a “regular home,” having friends over, being the one who hosted for holidays, decorating. Opening up my home to people who needed a friend, who needed to come and vent. Or have a cup of coffee with somebody who needed prayer. Hosting book club and Bible Studies. I missed that so much. It was the biggest, number one reason that we didn't complete our goal of a full year of full-time camper living and traveling with the kids. It's huge for me, so I totally understand this question. I absolutely have extra cups and more coffee mugs that I need for that very reason. I am always the hostess for family events. I host something in my house multiple times a month all the time. The only reason you will see me not hosting is if we are sick or something. Thanksgiving is at my house. Christmas is at my house. Weekend barbecues. Memorial Day. Everything is at my house. The only holiday we don't host at our house is 4th of July because we have a different tradition based on going to a park in our area with a bunch of friends at our church. I love hosting. It's a huge part of who I am. This is also one of the biggest reasons that Brian and I prioritize our home financially. Putting money into the outdoor space with lots of seating, making it really beautiful and welcoming. Using the front room and forcing an extra living room in there even though our house wasn't really designed to have a front living room and a main living room. We made it work and made sure we had extra seating and sofas in two living spaces because we like to host. This is why we wanted to create a welcoming space and we're happy to open up to others. It's a huge part of our family and our legacy. We love being hospitable. You'll often find us saying, “Oh, why don't you guys just come over this weekend and we can talk about it.” We love hosting. We have two coffee machines for this reason. We have a lot of things that are circled around opening up our home. You have to make minimalism work for you. If you don't, if you like to entertain, and purging certain items will make that difficult or more expensive for you, then why would you do that? Why would you let those things go? If you do that, and in that case then what you're doing is getting into this sort of legalistic minimalism, which is focused on following a set of unwritten rules and letting go of things because you technically don't need them, and because you think that you should let them go. Not because it isn't serving you and you know it's right for you to let it go. You've got to know yourself. You've got to know who you are, what you like to do, what lights you up, how you use your home. Even if you aren't super hospitable like I am and like the person who asked this question is, if you have kids, they're going to have friends over every now and then most likely when they're teenagers. We all want to be the place where the kids hang out, right? So we can keep an eye on them? If you don't have any extra things it's just not a reliable way to live. This is why I have a whole lesson on this in Your Uncluttered Home where I talk about having extras. But if it really bothers you, if it's really creating more work for you, if your family is pulling out the extra mugs, cups, and making more dishes for you, then store those things in another place separate from your regular dishes. Pull those things out when it's time to host something. I totally understand. And that's what I would say to that question. Really quick note on the part about “I don't have an abundance of toys for kids to play with when they come over.” That doesn't matter. We have a limited amount of toys. We definitely have toys. I've shared before that we have a bin of Legos in the homeschool room. We have a toy bin that we purchased at Ikea. (I think they discontinued it. I always get questions about our toy bin. I think it's gone because I can never find it to tag it for anyone.) All the toys fit in there. The kids will go into the kids’ room and pull out the toys and play swords. I will tell you this. What normally happens when we have a playdate and we have friends over, is the kids will go upstairs and they'll kind of explore. You know how it is when you go to somebody's house and your kids want to explore? What's their house like? What toys do they have? They will go up there and they'll either pull out something, make up a game or story, and play “imaginary play” like my kids do all day, every day, or they'll end up playing outside and not really using toys. I have found that because I have four kids and they're used to playing this simplified way of playing, that they pull their new friends into the way that they like to play. But, we do have toys and they do get played with when friends are over. If you have like a “toyless existence,” I don't really know what to tell you because we just don't live that way. We just have less. It's not really a problem when friends come over. Question #2: I noticed you seem to be reading a lot of faith-based books right now. (Yes, that’s true.) What are they? Do you mind answering? When I read I like to bop around by topic. For a certain amount of time I might be really into reading about business and growing my knowledge in that area of my life. And then next it might be faith-based books. Maybe next would be parenting, marriage or personal growth. I bop around by topic and I'll get really into a certain area of my life and read a bunch of stuff on that topic. Then when I feel I'm burnt out focusing on that area of my life, I'll move onto the next. That’s just me. It's just a natural way that I take in books and content. It isn’t something intentional that I set out to do. Here are some books that I've been reading right now. I just finished Man, Myth, Messiah. It's a book much like The Case for Christ. I don't know if you guys have ever read that. It's really famous. It's a book that dives into the historical facts that prove Jesus existed, and prove who He was. I've been really interested in diving deeper into my faith. I was raised Christian. I went to a private Christian school. After I graduated high school I was at a point where I needed to decide if this was going to be my beliefs for myself, and not because I was raised that way and I went to a Christian school. I went on this little mini journey of finding God for myself. I did and I continued to live the way that I was raised. But lately I've been interested in learning more. I want to know the facts. I've been really interested in diving into that area of my life. So I read Man, Myth, Messiah in paperback, and it was great. I'm currently reading God's Not Dead, which is actually the Prequel to Man, Myth, Messiah written by the same author. It's really good. You may have heard of it. They turned it into one of those super cheesy Christian movies that I have not seen. I cannot stand those movies. I think they're so cheesy. I'm glad they're making them, but wow, the acting, I just can't handle it, so I'm reading the book. It's really good. I'm listening to an Audible book called Poverty, Riches and Wealth: Moving from a Life of Lack into True Kingdom Abundance. It's basically a biblically-based book about wealth, money, money management and all that, which is something that I am always seeking to be more wise about. Question #3. Can you share how you read so much in the busyness of life? It seems like you have so much going on, yet I always see you taking on a new book. Please share how you do this. Absolutely. First of all, you have to understand the season of life that I'm in. I did not read this much when I had tiny babies and when my husband was working at his job, which I always say it was a 9-5, but it was not. He would leave at 5:30/6:00 in the morning and he wouldn't come back until after 10:00/10:30 pm sometimes. The earliest he would come back was at the kids' bedtime. So, I did not read this much back then. I didn't really do audio books back then either. Understand the season that I'm in. Brian is home with me. We run our business together. We share the homeschooling load. We share the house load. Our kids are older. Emmett is 3-years-old (at the time of this recording, he’s 3 ½ , so I'm kind of out of that psycho season). I've always been a reader. I've always been a bookworm, but it was a lot slower than it is now. The reason that I read so much is that I let myself. I gave myself permission to let go of this weird rule I had set for myself of not reading more than one book at once. I used to only read one book at once and I wouldn't let myself start a new book until that book was finished. I realized it was weird. I put that on myself. I think that's actually really common. I've heard a lot of people say they do that. It was really holding me back from reading because sometimes I don't want to pick up that particular book. I want to pick up a different book. I let myself have a couple of books I bounce around between and they sit on my coffee table. Whatever I'm currently reading is either in my purse, because I take my books with me wherever I go, or it's sitting on my coffee table. I'll pick up one of the two books that I've got going on. They're usually around the same topic, the same type of book. I'll read as I can. I read for about 20 to 30 minutes every single morning as part of my morning ritual. I shared that in an earlier podcast episode, which I will link to in the show notes if you guys are interested in that. I definitely get a chunk of reading done then. If I only read then I would still read a lot and I would still plow through my books pretty quickly. That alone could be a reason why I read so much. But like I said, I bring my books with me everywhere. If I have a second, if Emmett falls asleep in the car, I will sit for a little bit and read my book instead of getting in the house and unloading him, hurrying up and coming inside to get onto the next thing. I think with minimalism comes a slower-paced life. Even though I'm very busy, my life is incredibly full. My days are stacked with my morning routine, then I get into the work day. I have house stuff to take care of. I homeschool my kids. When there's baseball season, we have baseball. We have horse lessons. Then making dinner and getting the kids in bed. My days are stacked. Even with all of that, there's a slower-paced lifestyle that we have because we've simplified so much. That's the way we are as a family. I would say one of the biggest reasons that we do homeschool our kids is because we wanted to have a slower-paced life. When our kids were in school, we were always dropping off somebody or picking up somebody at different times and it was just crazy. It was really a lot and it just didn't allow for a very slow-paced life. We felt like we only got a couple hours with our kids each evening and those couple of hours were full of homework, cooking dinner, going to baseball practice, and going into the next thing. We really didn't like that. With this slower-paced life, there's room for things. Room for, “You know what, the kids are happy. I'm going to sit in the car for a few more minutes and read a few pages.” I'll take my kids to the park and I'll bring my book and sit on the bench and read a few pages. Then I'll go play with them and we'll go home. Maybe I need a second to myself in the midst of a crazy day when I'm feeling like I'm losing my patience. I'll tell Brian, “Hey, I'm going to go upstairs for a second and just breathe.” I'll bring my book, read a page or two, catch my patience again. Then come back downstairs and finish the day with my family. I'm kind of sneaking it into my life throughout the day, but the biggest chunks of time are my half-hour of reading in the morning as part of my morning ritual, and sometimes I will read instead of watching Netflix. I always have an audio book going at the same time as whatever paperback book I'm reading. I listen to my audio book every morning while I'm getting ready. So, with my morning routine, I have my quiet time and I do Pilates, read a book, read my Bible, and I have my prayer time and all that. But after I make sure the kids have had breakfast, make sure they're good, I go upstairs and I get dressed for my day. I'm doing makeup and throwing my hair together. It's usually only like 20 minutes. I will open up my Audible APP and I'll hit play on whatever audio book I have. Right now my audio book is Poverty, Riches, and Wealth. I just finished a book called Jesus Feminist on audio and I listened to that every morning while I got ready. 20/30 minutes of getting ready, sometimes it's just 10/15 minutes depending on the day, but a chunk of time every single morning listening to an audiobook, I get through it pretty quickly. That's how I do it. I have a lot going on, but I still make time for reading. I think it's really important to read. I teach my kids that too. Reading is power. Books are our power. Knowledge is power. It's important to always be growing, always be learning about a different area of your life. It’s important to not stay stagnant, but always be learning, growing. I think reading is the way to do that. Those are the little tricks that I do to take in so many books all the time. Question #4: I love your teaching and I want to go all in. Which course is best to start with and why? This is a really great question. I think it's one of the top five most asked questions. I see this all the time in my Facebook group. It's really popular. I'm happy to finally give this an answer. First of all, if you go to my website and you click the courses tab at the top, there is a video explaining the differences between each of my courses. I have a breakdown of a picture and the title of the courses, a little bit of a quick recap of what they are. And then if you scroll down, you'll see a video of me and I am explaining the differences between each of my courses because I want to be super clear. I want you to know what you're purchasing, know what you're enrolling in and know exactly what you're getting. Each course has its own separate “about” page where you can read more details about exactly what is this course, what's in it, and where is it going to take you? Who are you going to be when you come out of it? Because if you go through the entire course and you do what I'm saying, you will be a completely different person. Who are you going to be when you come out of this course? My courses are legit. They are serious. It's a deep, deep dive into each area of your life. If you think that my free stuff is helpful, if you really like the podcast, if you really like my blog posts and the free downloads, you have no idea how much of a serious dive into all this stuff the courses are. It is a heavy, serious power punch to your life. You will be different if you go through those courses. I want you to know what you're getting into and I explain each thing in the video and on that page. Also, I have designed my courses so that you can start anywhere. You can start with any of them. It just depends on where you're at and what's popping out at you more. If you look at the description for Unburdened and you're like, “wow, I really feel like this is really where I'm at right now” and it's just kind of speaking to you, enroll in that to start with. If you're reading about Your Uncluttered Home and clutter is a huge, huge, huge drain on you right now and that's just where you're at, that's where you should start. If you just kind of want to see who I am, maybe you're new and you don't know what I'm all about. You just want a little taste of something and you don't want to spend too much money, then try the Supermom Vault. That's why I designed it. It also depends on your budget. The courses are all priced pretty differently and the prices of my courses reflect how deep of a dive they are and how much you will get out of each one. So, if you're able, I would always start with Your Uncluttered Home because I believe it all begins at home. It did for me in simplifying my entire life six years ago. It all started at home and it's a domino effect from there, but it could start somewhere else for you. I'm just telling you, I know for a fact that if you start with your home and you simplify your physical clutter you will be changed. Science shows us, my life has shown me and the lives of thousands of other women all across the globe who have done Your Uncluttered Home, have shown me that if you start at home, you are setting yourself up for success. You are changing yourself on the inside and that affects everything - you're eating, your relationships, your calendar, your schedule. All of those things are affected by how you simplify your home. A few months ago, I introduced “course bundles” and that means that I take two courses that go really well together and I create a bundle price, where I put them together and I slashed the price. So instead of getting Unburdened for $69 and Your Uncluttered Home for $200, I will slash Unburdened down by like 30/35 bucks and you're getting them both for $230. Does that make sense? It's not a buy one get one, but it's close and it's a lot less. So, if you're going to get multiple courses, you don't really know where to start and you have the budget, you can just bundle it together and get two at once and start wherever you want or do them both at the same time. One quick side note that I do want to say. This question isn't in here, but it's directly tied to the last question and I get it a lot. The way to start with my courses is once you enroll in something, just start listening. There's always a “start here lesson” at the beginning. Start there, watch that video, listen to that audio, get that content in your brain and just start listening. Maybe you can replace a book with my course, do what I do and listen a little bit every morning, even just five minutes. Just get through the lessons. Start taking in the content. Then what I always tell beginners who have a really full life - maybe they have a baby at home, they work a lot, they are just really busy, really overwhelmed - take one week and spend 15 minutes every morning listening to the course. Then the next week, take that 15 minutes and apply what you learned last week, every day for 15 minutes every morning. That's it. If you can get in an hour, if you end up doing 30 minutes instead – great! But just have the goal. Set a timer for 15 minutes, listen to the course every day for 15 minutes for one week. Then the next week, take action on the course for 15 minutes every day. Just 15 minutes. Start there and keep that pattern of every other week taking in the course and the weeks in between taking action on the course and you will slowly, but surely change your life. And really that's not that slowly. That's a lot. It's going to go quick and you're going to see a huge difference in yourself, your home and your life. Minimalism has so many benefits. You hear me talk about them all the time! But one of the benefits that I haven’t talked about yet is the positive impact minimalism can have on ADD. Living with ADD amplifies the feeling of being overwhelmed by a never-ending to do list and expecting perfection 100% of the time. But when you clear your space, you free your mind of striving too hard. Believe it or not, physical clutter adds to the struggle of being able to focus! This issue is super close to my heart and it was a true honor to sit and talk with fellow-mama Chelsea Reinking. Her journey with ADD and motherhood is empowering! 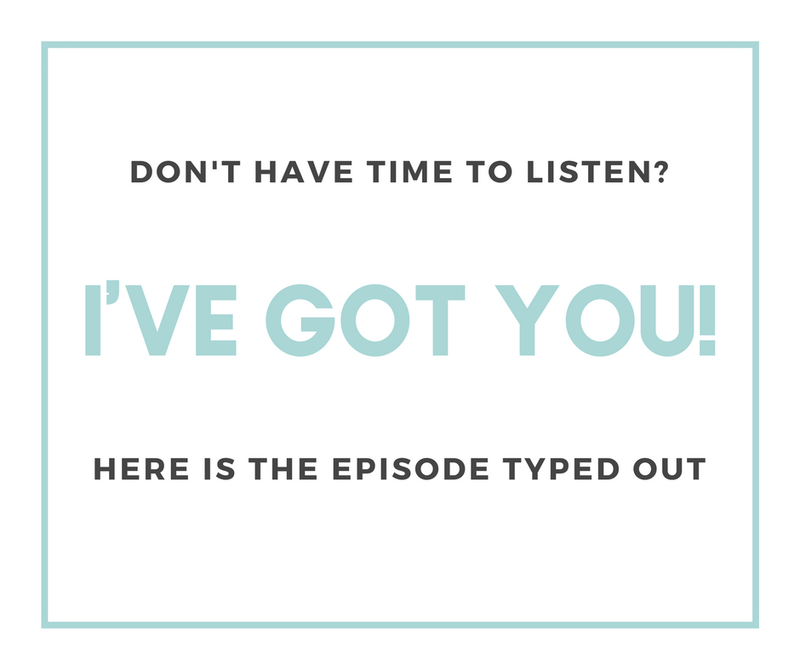 Whether you struggle with ADD or not, I believe you will find great value in listening to this episode. How ADD or ADHD can affect you as a mother. The difference you will see in your quality of life when you clear your space of physical clutter. The correlation between physical clutter and your ability to focus properly. Things you can do to immediately break the mental cycle that ADD traps you in. Tactical tips to help you refocus when you feel overwhelmed. You buy stuff with your time, not just your money. Less clutter equals less stress and more time. It's as simple as that! Your Uncluttered Home is my most popular, globally-praised decluttering course, designed for moms who want to live their lives more than they clean up after it. It's truly the A-Z of minimalism - every room, every area of your house, totally uncluttered. This super extensive, extremely detailed course is literally everything you need to become a minimalist mama who's able to be a lot more present for what matters most. This truly is the ultimate when it comes to my philosophy and implementing it into your own life. ALLIE: Hey friends. Welcome to another episode of The Purpose Show! I'm extra excited and really honored to be coming to you with this episode. We're talking about some pretty serious stuff here today with Chelsea Reinking. She is kind of an amazing mama. She's just finished writing and is about to submit a paper for college on the effects of minimalism on people who struggle with ADD. This issue is close to my heart as my mom struggles with ADD, so I'm really excited to dive in and talk to Chelsea about this topic. Thank you so much Chelsea, for taking time to talk with us. CHELSEA: Well thank you Allie. I really appreciate it. ALLIE: You are diagnosed with ADD, correct? And you wrote your paper on the effects of minimalism and ADD. So, we want to hear from you. Can you start with a little bit of a background of your story, what made you want to get into this topic, how ADD has affected you? CHELSEA: Right. So, I have struggled with learning. I went to public school throughout my whole life. In third grade, I remember having such a hard time with spelling tests. My mom noticed this as well and would seek to get help for me. My teacher said, “Oh, she's fine. She doesn't need any assistance and we'll work through it.” And through that came a diagnosis of a learning disability, which actually didn't get really diagnosed till 2014, when I went back to college when I met with my doctor. It was just labeled as a learning disability and wasn't titled ADHD. With that came not really getting help in the public school system until I got to college. So, it has been such a struggle. It beats you down as a person when you fail over and over and over again. That is another thing with ADHD emotions, that frontal lobe comes into play when it’s talking about emotional things. You are more likely to feel all the “feels” and cry, so I will try and hold it together. ALLIE: Do whatever you need to. I don't know if you've listened to a lot of episodes, but I have cried a couple of times on my show. I ended up sobbing during a live stream in my Purpose Society Group last month. What we're doing is important and it's important to us. When I'm talking about my story or depression or PPD or whatever, I get super emotional. I totally understand. It's all good. I think it also helps people understand the importance of this, and anybody who maybe is diagnosed with ADD or ADHD thinks they might have that issue, this is going to communicate in such a powerful way to them that it's okay and there are things they can do to lighten that load. Chelsea, I would love to hear from you. How does ADD or ADHD affect you as a mother specifically? CHELSEA: Oh, that's a loaded question. For example, when I'm making dinner. My daughter is two years old and she loves her mama. Making dinner for me is a struggle. Following a recipe, getting everything out on the counter and following through with it, finishing the task at hand without burning anything. But then when you have a toddler or an infant needing you and being called in that other direction, you will completely just want to crack and break and cry and scream. And then especially if you have a spouse at home, maybe doing their self-caring because they just got done with a hard day's work and trying to respect that. All of that anger builds. Having minimalism worked in with this as she's getting older, I see how beneficial it is because now when I say “Can you go get a toy or a book,” she knows exactly which one she wants because she doesn't have a million toys to choose from. And the other thing going back to the kitchen is now I have set it up to work for me instead of against me. For example, a utensil, like a spatula, I only have two maybe, where you could have way more than that. I would grab a spatula that I don’t really like and that one would go in the sink, because I only used it once and decided I wanted another one. So, definitely pairing down on what you have around you eliminates those overwhelming factors. ALLIE: Since you brought it up and that's where I wanted to go next, let’s talk about the idea of minimalism and this philosophy of less clutter physically. We talked about this when you interviewed me for your paper - how you were repeating what I'm always trying to get across and I love how you said it - that it's not just about having a clean space, having an uncluttered space. Everyone always says this to me and it drives me crazy. I know that they mean well, but it drives me crazy when they say it - being organized. It is not about that at all. I'm actually a really disorganized person. I'm a really busy person with a lot going on and you have the same thing and you have the ADD struggle. It's not about wanting to be super organized. It's a fight for survival. It’s a means to a simpler, more abundant life in the middle of chaos. Can you maybe focus on an area aside from your kitchen, since you already shared that, where minimalism has profoundly impacted you? How have you seen such a difference from clearing your physical clutter to improve your quality of life? CHELSEA: Right. This one’s very personal. My birth mother died when I was 9-months-old. I was given a lot of items of hers later on in my life. Of course, I wanted to keep all of them, because her mother, my grandmother, had saved these things. In 2017, after joining the group that you had on Facebook, I really thought about pairing down more. I went through all the items, worked through all the “feels” and I got rid of a lot of it. Number one, it's not my birth mom. It’s not going to bring her back. It doesn't really keep her memory alive because those memories that are given to me are storytelling from other people, so they are still there. I did actually keep something longer. This last Christmas, Christmas 2017, I was going through the box of Christmas items and I found the stocking she had made. She passed away in December. She made stockings for us. Her name was Melanie, which is my daughter's name. I'm going to call her Grandma Melanie. Grandma Melanie made stockings with our names on them. I asked myself, “Is this giving me joy or does it just really made me feel sad?” It really made me feel sad, so I took a picture of the two stockings and got rid of them. So not only has that freed space in my home, but it also freed space in my heart. That made sense. That emotional attachment to things is really just holding people back. And once you can let go of those things, it totally frees you to fill yourself up with all the good in this world. ALLIE: I love that you used that example. That was so amazing and so personal. I think that it's really good that you did that because there are so many different types of emotional attachment to items. Also, I think it's really empowering. You didn't really know your mother because she died when you were so young, and it's almost like out of everybody that I've ever talked to, it seems like you would be the one to really understand that struggle. You overcame that and I think you're amazing for that. That's so, so incredible. So, you realized the physical clutter was adding to your struggle with focusing. Focusing on what matters. Focusing on what you need to get done right now. It was distractions. Then there’s the emotional level with your mother. Those things were keeping you sad, keeping you back, instead of being able to move forward and be open to the positive emotions of the things that are happening in your life right now. I was texting my mom about you after we had spoken for your interview with me and preparation for this one. And my mom was like, “Oh my gosh, I'm so overwhelmed. I have so many things I would want to say about that or want to say to her and she sent me this text I'm going to read you. CHELSEA: Is it going to make me cry? ALLIE: I don't know, but it made me really emotional for sure. I was texting her, “I'm crying right now. I'm so sad.” I wanted to read it because it gets the point across. As a person that doesn't struggle with ADD, I think that this gets the point across. If anyone is ADD, it would give them that validation that this is something that can be very normal and common, but you might not even realize you're dealing with. Some background…I'm sorry, I'm jumping around. I'm the oldest of four and I'm way older than my siblings. My parents had me a few years into their marriage. My mom was struggling with some serious internal stuff from the way that she was raised and so there was a big gap. My parents didn't have any more kids for a while, so my siblings are much younger than I am. My youngest sibling is about to graduate from high school and I'm 31, so there's a pretty big gap there. I thought it was so interesting that even though she's been out of “the thick of it” for years, that she feels like she's just now coming out of it, because the chaos is internal. She continued to say you make it up in your own head. You can’t focus, so there's extra chaos internally when really on the outside, it should be pretty manageable. Do the laundry, make dinner, spend time with your kids, help them with their homework, get them in bed. But inside it's this mess of distractions and brain clutter. So, would you agree with what she was like? What would you say to what she's saying? CHELSEA: 100 percent! It was amazing. Actually, it really reminded me of part of my paper in the introduction. I say living with ADHD amplifies that overwhelmed feeling of the never-ending to do list and expecting perfection 100% of the time. I feel like our brains are just beating us down over and over and over again. Allie and I actually have very similar stories with our background. My youngest sibling is 9 and I am 30. ALLIE: Okay. Wow. Even bigger gap. So, you get the big gap thing. that method of, “Okay, what needs to be done right now? What needs to be done later? And what doesn’t really matter.” We don't have that, because everything feels like “It has to happen now, or else, I'm failing.” It is expecting perfection. Definitely adopting having less around you to distract you when you do that is good. So then in turn that would have directly impacted what I'm doing as a person, my life choices. My first thought was, “Oh my gosh, I simply could not handle that every minute, that burden, and also have four children.” We probably would have had fewer kids unless I had found some solutions with it. I was so burdened just by hearing her talk about it. People who are struggling with this it is affecting their lives in profound ways that they may not realize because that's all you know. That's the way that your brain works. If that's all you know, you only know you. I'm just tearing up as I was listening to you talk because it’s this realization of, “Oh my gosh, my mom did such an amazing job!” I didn't even know that she struggled with that until she told me when I was older, and she was figuring it out when I was in high school. To encourage you and anybody listening who's falling into this camp, the kids - we think you're doing great. We don't even notice. We don’t think, “Seems like mom can't focus like other moms can.” I never noticed or knew anything. My mom did a phenomenal job; she's the best mom ever. I never knew. Also, to give hope to you and to anyone listening that has this issue, that I think it is all internal, just like my mom said. It is internal and even your doubts and your fears about what this is doing to you as a mom and your family is very internal. Sure. There are things that you notice, how mom was a little scattered or she seemed really stressed out, but every mom has that in some way. It’s just a little different for you. ALLIE: Okay. Getting back on topic. From that text from my mom, we were texting through and trying to come up with one question that she would want to ask you, just to be a voice for somebody who's struggling with ADD. This is what we came up with: What are some things a person struggling with chronic overwhelm can do to immediately improve their life or to break the mental cycle that ADD traps you in? I feel like we talked about simplifying and minimalism being that thing, but I wanted to ask you anyway, to open the floor to anything else you want to say or to branch off of that even more. And then start generating, “What is your goal?” Even taking the simple steps for that day, “What is my goal for today? What will make me feel accomplished?” Work that in. If it is during making coffee. If it is during nap time or during a shower. Making time for yourself. I listen to this podcast while I'm in the shower because that is really the only time I have for me. Designate that time. So, there we go. First, identifying a goal. Second, identifying a time and making yourself do it and stick with it. And if you get distracted, that is OK. Refocus your mind. ALLIE: Do you have anything tactical or more practical that helps you with that? Like does it help you to write it down and look back at that piece of paper? What was I going to do today? Is there anything that helps you refocus or is it a total mental thing for you? CHELSEA: Initially it does start with paper, but that paper is not in your hands all the time. Or your phone is not. Or your calendar is not. So, it really does become a mental game. Especially when I get stressed or overwhelmed, I feel myself side tracking. It does really help to say these things out loud. Just say, “Why am I here? What is my focus, what is my goal?” And then identify those things and then follow through. I think when we hold ourselves to the expectation of making a list every day, it won't always happen. Knowing that you can refocus your brain and tackle what is needed to be done at that time is really amazing. ALLIE: I just love that so much. I'm trying to sound super smart and add to it and I have nothing to say because I love what you said. It was so encouraging and also practical at the same time. It's easy to talk about grace or talk about giving yourself space and not really give practical advice and you just did both so well. Oh my gosh, that was so good. I can't wait for my mom to listen to this. Is there anything anywhere that you want to link to or anything you want to say to wrap this episode up? I feel like that was just so good. I just want to end there. Is there anything you want to add? CHELSEA: Just be kind to yourself today. Give yourself a pat on the back. I'm actually taking a detox from social media right now. A lot of things that are coming due so I need to stay focused. I would love to give you my paper after it is completely done and have that available for people to read. ALLIE: Yeah, we can link to it in the show notes. Definitely. CHELSEA: Okay, perfect. If anyone has any questions I would love for them to feel free to email me. ALLIE: We’ll put that in the show notes. Thank you so much for making yourself available. You can just tell you exude passion about this. I think it's very overlooked for mothers specifically, and maybe that's just because I'm not in it and looking for things, but I have never come across anybody who has as much passion, knowledge, care and grace for people who are struggling with this. I really applaud you for what you're doing and the way you speak on this topic. I'm really honored to have you. I hope that this episode gets into all the ears that need it so, so badly. So, thank you so much again. This was really, really great. CHELSEA: Thank you Allie. I really appreciate it. ALLIE: Okay guys, we will link to Chelsea's email if you're struggling and you just want to reach out to her or to thank her for this. Whatever it is, we’ll link to her email address. We'll definitely link to her paper that she wrote when she's finished with. We'll link to all of that so you can get more of Chelsea and all the work she's been doing on this after this episode. And as always, if this episode was impactful for you, tell us. Leave a review on itunes. Reviews are everything and I always appreciate it. I’ll talk to you guys next time. For our family, we take it year by year when it comes to whether we homeschool our kids or send them to public school. And I get asked a lot about how we handle the transitions. It is such an adjustment for everyone. Sometimes the adjustment is easy + other times it is a little more challenging. In this episode I want to share my experiences with the transitions but also want to give you some tips on how to make public school or homeschool easier on you + your family. And remember that no matters what decisions you make about schooling for your kids, you are an amazing mother! Tips for transitioning between homeschool + public school and vice versa. Her experience with transitioning kids in the middle of the school year. Different ways to make the most out of your schooling experience, whether it is public school or homeschool. The Developing Rhythms Workbook will help you figure out what rhythms are, how they are going to help you, what yours should be, and when you should do them. The whole shebang! If you go through this workbook you will end up with an amazing set of rhythms that will help you in your life and in your role! Hello ladies! Welcome to another Bonus Episode of The Purpose Show! This is Bonus Episode 2 and I am really excited to dive into this one. I am going to be talking about transitioning between homeschool and public school. Whether that’s from public to homeschool or from homeschool to public. We are going to cover all the things that I think are most important about that. We have done both. I get asked about it all of the time and I want to lend a hand. In case you are not sure (maybe you haven’t listened to one yet), Bonus Episodes are really neat. They are episodes that are so exciting for me, and so full of good stuff for you, that I can’t wait to release the content. As you probably know, the podcast is planned out pretty far in advance. Sometimes I get a good idea and I don’t want to wait until three months from now to release that episode, so I will make a bonus episode. Or if I get asked about something so often I will make it a bonus episode. This one is the latter. You guys have asked about this so much because I have been somewhat open about sharing our journey between home and public school and back again over the last year or so. I am going to talk about that. First, let’s discuss going from homeschool to public school. I first want to say to those of you who have been homeschooling and have decided to put your kids in public school that I am not here to help you make that decision. I am not going to be addressing that. It’s a lot to homeschool. It’s a lot to have the kids in public school for different reasons. There is a lot that goes into it. There have been a lot of different things that have led to us homeschooling, putting a pause on that, putting the kids in public school. We always knew that it would be temporary, but we weren’t really sure. We thought it would be for a whole school year, but it ended up being much shorter, and was just for one semester. We do our best to be spirit-led parents. We prayerfully make our decisions. I will not be addressing that – that’s all your decision. But I will be talking about if you have already made the decision to switch from one to the other. I will help in all the ways that I can think of. So, going from homeschool to public school: The first thing I want to say is the whole point of homeschooling is to go slow and lean towards child-led learning in order to give your kids a passion for knowledge and learning. This is not the way the public school system in most states is set up. Nothing negative about them. Nothing against the public school system. I am definitely not one of those homeschool moms who has terribly hard feelings about the public school system. I really think that it is a lot to handle over there. And I think they do a great job on a lot of things. I think teachers are some of the most amazing human beings on the planet. I am very grateful for them. I don’t homeschool because I am trying to keep my kids from something. Having said that, giving your kids a passion for learning, going really slow, leaning into each kids individual needs and what they want to learn about, and doing that child-led learning is not the way the public school system is set up. Homeschooling generally is. You are probably going to encounter some push back from the way you did things as a homeschooling mom as you transition your child or children into public school, and that’s OK. You were doing what you believed was best for your child during that homeschooling time. That’s the best thing you could have done. Now here you are with life happening and things changing, shifting, and again you are doing what you believe to be the best thing for your child and your family in a different school year, or half way through the school year. It is just an adjustment for everyone, and it’s OK if it is a little hard. It is OK if people let out a sigh, or make a passive aggressive comment, or make a face. Maybe they aren’t rude, but they don’t seem like they really get it when it comes to you homeschooling, where you are at, what they learned and how you taught them. I think it is important to remember that it is your teacher’s job to help your child. She works for you and for your child, so don’t let anyone put you down or make you feel badly. You are an excellent mother. I feel like some of you need to hear me say that to you. I feel that with my whole heart. If you’ve even listened to this podcast. If you have even attempted to homeschool your kids. If you’ve even taken your kids to public school, kissed them on the cheek and bid them goodbye, you are an excellent mother. Don’t let anyone make you feel otherwise. I think it is really important to be as available as possible for your kids after school, especially if you are worrying about how this is going to go. Maybe you are used to spending all of your day with your kids, but now this (afternoon's) is now your time together. I know it is near the end of the day and you are all exhausted, but this is a crucial time for creating a safe space for your kids to talk with you and for them to connect with you after a day spent apart. Set up a system for all the things that come with going to public school. There is going to be more paperwork than you could ever imagine. Set up a system for that. For me, I had a wooden paper sorter, that I got at Target, right by the door. When the kids walked in the door, they had a job. They had to hang their backpacks on the hooks and get out any paperwork that the teacher put in their backpacks and put it in their file. You will have a lot of paperwork; come up with a system that works for that. You will have backpacks, shoes, jackets, and just stuff. When the kids get home, the first thing they are going to want to do is strip it all off and dump it. That will be their habit unless you set up a system beforehand. Get a system for paperwork. I highly recommend that you keep it by the door where the kids come in, even if it is not super pretty. Have a system for the paperwork. Hooks for backpacks. A bin for shoes. Where do you want your kids to put their things when they come home? What system do you want to set in place so that your house isn’t overwhelmed with the things that the teacher sends home? The other thing I would say is set alarms for pick up times. I know it might seem silly and obvious to pick up your kids from school, but when they are gone and you get into your own quiet-time headspace, or you get caught up in a younger child, it is amazing how easily you can get busy and almost miss leaving in time for pick up. Or totally miss it like I did once for Hudson. Poor little guy was sitting in the office with his little feet dangling from the chair because I was ten minutes late to get him. Set up alarms for pick up times. Set a really annoying ringtone. Make it a repeat alarm every day, if even it gets annoying. There will come a day you will be thankful you set that alarm. Speaking of pick up times, make use of them if you can. These were some of my favorite moments when my kids were in public school. I would leave early so I could get a great parking spot. I would use that time waiting for my kids to read a book, or listen to a podcast, and have some amazing self-care and personal growth time. It was a great in-between-the-day time for me. It would have been easy to work and leave at the last minute to get the kids. Or send my husband and keep doing the housework. But it was a really great anchor for me in the day for self-care. It was a great time to hit the reset button for the rest of my day. Establish open communication with your kid’s teacher. Be pleasant and friendly, not harsh and judgmental. Not every teacher, but some teachers have reservations about homeschooled kids. It has become a kind of “war zone”. I think being really sweet, kind, and establishing a good relationship with your child’s teacher from the beginning is incredibly helpful. It will serve you and your child well throughout the year for your teacher to like you, and to have open communication. With each of the kid’s teachers, I sent an email after the first day to thank them for being there, ask if they had any questions. I included a little note about each child that I thought would be helpful for the teacher. I made myself available and that really helped to establish a good relationship for us. Also, establish a set time every day that you help your kid with their homework, especially in the beginning of this transition from homeschooling. Maybe your child will be further ahead than the school, or maybe the school will be further ahead than your child. This is a transition. You are used to doing school together. One mistake that I made was thinking all the school stuff would be off of me, and I wouldn’t have to do anything. Maybe that sounds self-centered but that’s what I thought. Being available to help your kids with this transition during the time that you are with them, is really important because they are going to have questions. They may not be used to the different curriculum, especially if it is common core and you haven’t been using that. They may feel really dumb and feel like the school is way ahead of them. They may feel incredibly bored and unchallenged because you were further ahead than the public school system is. I wish that I had scheduled time in my afternoon. I wish I had done more crockpot meals so I had nothing else to do when the kids got home from school but just sit with them. Be with them. Help them with their homework. Everyone was in a different level. Each child, in different ways, struggled with this transition. Block out some time and don’t schedule any other things. Create a couple hours of space to be available to help with their homework. Also, figure out what you want to do with your weekends. Homeschoolers are used to being together more than public schoolers are. You might find that during the weekend you are excited for some awesome, much-needed family time. You might find that your kids are bogged down with a giant load of homework that the teacher has sent home for the weekend. Set up a system for doing homework on Friday nights so that your weekends are free. Or you can have a fun family night on Friday and dedication a portion of your weekend to homework, like maybe Sunday evening. Either way, plan ahead. Realize what you are dealing with. Maybe there will be a weekend where they won’t have any homework and that would be great. But more often than not, they will have homework. Decide and plan ahead of time so you are not feeling disappointed. That negativity and negative emotions about your kid’s school, teachers, and their homework will rub off on your kids. Also, Bento Boxes for your kids lunches. I am going to share my affiliate link in the show notes for these because they are AMAZING. I cannot say enough about them. I shared them on my Instagram story when my kids were in school. I still have them and we use them a lot for park days. They are basically metal boxes that have dividers in them. There’s a sandwich area, fruit area, crackers, etc. They are just awesome. They slip right inside basically any lunch box that you can get at Target, or anywhere. They are a little pricey but we really love them. I found them from Robin Long of A Balanced Life. I saw her making her kids’ lunches in them and thought, “that’s super handy!” They are worth the money and are so helpful. I love that my kids aren’t eating out of plastic every day. I love that they are divided. My son, Leland, hates when his food touches. I am like, so I totally get it. They keep his food separated. They are just really, really handy. Enjoy your new-found time without your kids. I just want to give you permission. It is OK to enjoy it. It is OK to be sad that they are gone. Trust me. I balled my eyes out for the first day the kids went to school. I didn’t know for sure if there was an end in sight. I didn’t really have a strong desire to send my kids to public school. I have always had homeschooling on my heart. But I couldn’t do everything and the business was very overwhelming. Brian and I had both made that decision that we needed something to give so we could focus and not be stretched so thin. It was very sad. It is OK to be sad. It is also OK to be happier. To enjoy the quiet time. To love it. To have some time for yourself. Time to be caught up on the housework and other things in your life. It’s OK to have a job. It’s OK to have something other than your children and enjoy this time away from them. So now, let’s talk about going from public school to homeschooling. The first thing that I always say is to encourage you before you make the switch to research the different types of homeschooling. There are so many different styles. Find the one or two that really appeals to you. The one you feel would go with your personality and your family style. What do I mean by that? There’s Charlotte Mason homeschool. There’s unschooling. There’s traditional homeschooling where you are basically bringing the classroom into your home. Find what works for you. I would say you naturally gravitate towards things. For example, at first, I shied away from the traditional homeschool of bringing the school into the home. I really felt a pull towards Charlotte Mason, and unschooling. That really appealed to me. My next point is to keep in mind that your homeschool style may change as you evolve as a homeschool mom and you get more comfortable. This happened to me. I was so drawn to the idea of unschooling. We did that for a couple of years and struggled through it. That may sound funny, especially if you research what unschooling is. But what I ended up finding is that it just didn’t work for us. I love it. I think it is a great idea. I know a lot of people what it works well for. It just wasn’t working for us at all. I wasn’t happy. The kids weren’t happy. It just wasn’t working. We moved away from unschooling. We kind of kept the Charlotte Mason style and I threw myself more into that. It is OK for you to change, shift, evolve. You don’t have to know it all right now. Also, do not get sucked into the lie that you have to spend a billion dollars and have everything in the world right now. You don’t have to have everything figured out right now. I encourage you to have minimal school supplies. A minimal curriculum. Stay away from homeschool conventions for now. I know they may seem really helpful. When we decided to pull the kids, there was a very popular homeschool convention really close to my house. I was so tempted to go. You know what? I just got this feeling in my gut not to go. I already knew what I was doing. I was simplifying this process for myself. If I went, I was afraid I would get falsely inspired by the wrong things. I was afraid I would be pulled to buy all this curriculum and spend money on things that are just going to overcomplicate this for me. That was my problem in the past – that I tended to overcomplicate things, which made me overwhelmed. I will link to a book that has been integral in shaping my homeschooling experience and philosophy since we pulled the kids out of public school and brought them back home. It is called Minimalist Homeschooling. It is by a doctor who is amazing. It is such a good book. I encourage you to read it. The curriculum that I found had a couple of things that drew me to it. A friend, whom I really admire and I respect the way she homeschools her two boys, recommended The Good and The Beautiful by Jenny Phillips. If you go to their website you will see how homeschooling moms went from these massive piles of curriculum down to this one stack of books. It was basically a minimalist homeschool curriculum. Of course, that drew me to it. When I researched it, I saw that, yes, it was a minimalist curriculum. They are getting a rich curriculum with amazing photos, beautiful stories and pictures. It is very Charlotte Mason inspired. You can get digital products or paper products. I do well with paper so I ordered the physical curriculum, actual books. When I got it in the mail, it truly is as minimal as I think you can get. I definitely have the least amount of books and stuff that I have ever had with homeschooling my kids. Bella is in third grade and we are getting to the levels where there tends to be more stuff, and there just isn’t. I have been extremely pleased with this curriculum. Don’t get sucked into the lie that you need to spend all this money and have this “stuff.” (Check out my blog post How to Bring Minimalism into your Homeschool). I want to talk about pulling your kids out mid-year. Perhaps you are feeling led, feeling that something just isn’t right. “I want my kids at home, but I feel like they should just finish out the school year.” Weigh that out. It was really hard for me. It was in December. Winter break was coming. We had put our kids into public school so we could take a year off. We didn’t want to try to be like Jesus and do it all perfectly. We were both stretched really thin with work and schooling the kids. Tensions were really high at our house and it wasn’t working. We knew we needed to make a choice. We took a year off of homeschooling to grow the business, delegate, and hire a bunch of new people to lessen our workload. We thought it would take us all school year but it ended up only taking us a few months. By December we were pretty much done. We had hired 6-7 new people. We were both working just a few hours a week and it was great. We really wanted our kids home. We were torn between finishing out the school year or not. We prayerfully decided to let them get to winter break and then pull them out. They wouldn’t go back after winter break. That’s what we did and it has been the best decision that we had made so far. I was so nervous about it. I didn’t want to damage the kids or hurt them. I didn’t want to hurt their teacher’s feelings. It was really hard. Follow that peace. What’s going to work for you? Does it feel better to finish the year? To give yourself time and space to plan things out? Does it feel better to get them home and then figure it out? You have to prayerfully make that call. I do want to say that I have pulled my kids out mid-year. If that is what is feeling best for you, I want to give you that empowerment/permission. You’re their mom. You know what’s best. I would encourage you to talk to your kids openly about this transition and encourage them to be open with you in return. I think being really easy to talk to about the hard parts and not taking things personally is huge. For example, if your kids say something like, “I miss my friends from school” or “I don’t like this homeschooling day” in the middle of a frustrating math class session, don’t take that personally. Don’t snap back at them. Don’t make them regret being open with you. Encourage openness. Be easy to talk to. Take it as constructive criticism. Take a deep breath. Make appropriate changes. You guys are in this together. You are not perfect. You are not going to be perfect ever. You are going to make mistakes. Everything is “figureoutable” as Marie Forleo says. This is “figureoutable” too. Take a break. Stop teaching if it gets tense. Listen to your child. Look them in the eye. Get down to their level. Talk to them. You can make changes as necessary together. You are not going to be perfect and have it all figured out right off the bat. Also, let the kids’ previous teachers know that you are thankful for them. Whether you are pulling them out mid-year or not, I think it is important to keep that peace. Let them know that your decision to homeschool them doesn’t have anything to do with them failing or not taking care of your kids. Let them know that you are thankful for what they did for your child. Allow time for “de-schooling” if your kids were in public school for a year or longer. Your kids get into rhythms. Kids respond really well to rhythms for homeschooling. The schools are set up in a way that really does a good job of highlighting the fact that kids thrive under routine. It is very routine – you start school at a certain time of day, then circle time, language arts, break, then math, science, lunch, playtime. It is very regimented and scheduled and never changes. Also group learning is totally different learning than homeschooling, even if you have a lot of siblings. It is a lot more one-on-one than a classroom setting is. You have to allow some time for your kids to adjust. That’s called “de-schooling” in the homeschooling community. Let them get un-used to public school. Research. Look up the word “de-schooling” and find different ways you can do that. For us, it was an extended period of winter break. My kids were only in school for one semester, but I did feel like they needed a period of de-schooling, especially my son, Leland. We had a 3 ½ winter break. It was great. We slowly eased in to homeschooling. I also have a blog post about “Why We Chose to “Soft Start’ Our Homeschool + How It Works which I will link to. It talks about how you don’t have to hid it hard. Ease into this. Find ways to bring those routines that worked well for your kids in public school into homeschooling without it being too regimented to where everyone is miserable. On that note, I encourage you guys to come up with a flexible school schedule. We do a 5-day schedule. We school 5 days a week. If we skip a day here or there, it doesn’t make us fall behind in where we are supposed to be with the curriculum. It gives us some cushion. We do homeschool through a charter school because I do really well with accountability. I like the idea that somebody is keeping records for me. That someone is watching me, making sure I do what I am supposed to do. We have a 5-day schedule but we don’t always do 5 days of school. Most weeks we do, but there are plenty of weeks where we do 3 or 4 days. That’s fine. It ends up all working out to where we are supposed to be when we are supposed to be there. Decide if you want to do a 4-day school week every week. Or do you want to do a 5-day school week and be able to have some cushion. Look up different types of homeschool schedules. There are a lot of ideas. Six weeks on and one week off. Ten months on and two months off. Year-round or traditional schedule. We do 5-days a week and year- round because we have seen our kids get completely out of the loop with a summer break. Also, we believe that learning should be happening all of the time and be child-led. It feels weird to us, as parents and teachers, to teach during the school year and then just stop during the summer. We do a lot of unit studies, beach-themed studies during the summer, but technically we are doing school year-round, although our charter school is not. To wrap up, let’s talk about rhythms. Rhythms will help you tremendously no matter where your kids go to school, but things can get chaotic in a difficult way when you homeschool. You need rhythms set up for basically everything. Your housework. Your work schedule, whether you work at home or outside of the home. Your laundry. Your schooling. Everything that has to do with you and your role. Rhythms are going to cut your to-do list more than in half. Because it is no longer a to-do list. You have rhythms set up for things that just need to happen for your life to flow smoothly. It is no longer a to-do list; it is just habit. That is mentally freeing. I want you to get my free Developing Rhythms Workbook. It is one of my Fan Favorite free downloads from me. It is a workbook that will help you figure out what rhythms are. How they are going to help you. What yours should be. When you should do them. The whole shebang. If you go through this Free Rhythms Workbook, you will end up with an amazing set of rhythms that will help you in your life and in your role. I am excited for you guys! No matter why you are listening to this. If there is a transition possibly coming. If you are in a transition. If you just did a transition and it went terribly or it went amazing. I am praying for you guys. I know how hard this can be. Remember, no matter what’s going on, what decisions you have made so far, or what decisions you are thinking about making, YOU ARE AN AMAZING MOTHER! !